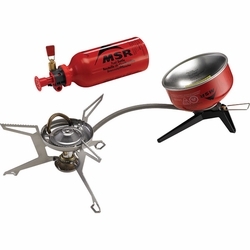 MSR WhisperLite Universal Stove. The WhisperLite Universal hybrid-fuel stove is the first stove from MSR to combine canister and liquid fuel capabilities into one comprehensive package. Built on an upgraded WhisperLite™ chassis featuring improved stability, lighter weight and simplified maintenance, it burns just about any fuel you're likely to find. And unlike anything that's come before it, MSR's patent-pending AirControl™ technology delivers uncompromising performance across all fuel types, and they have delivered it all in a lightweight package that won't slow you down. FUEL BOTTLE AND FUEL CANISTER NOT INCLUDED. Hybrid-Fuel Performance: Patent pending AirControl™ technology creates the optimal fuel/air mix for top-notch performance with canister fuel, white gas, kerosene and unleaded gasoline. Canister Liquid Feed: Delivers better cold weather and low-fuel performance with a more consistent output over the life of each canister. Canister stand Included. Lightweight: Aluminum mixer tube, extra-stable stainless steel legs and refined design keep weight to a minimum. Easy Transitions: Liquid and canister fuel couplers pair with fuel-specific jets for quick and easy transitions. Field Maintainable: Self-cleaning Shaker Jet technology and redesigned leg assembly facilitate fast cleaning and even easier maintenance in the field. Comprehensive maintenance and repair solutions for your Whisperlite.